We believe we should lift each other up, not tear each other down. Although short, this statement sums up the political atmosphere that led to Clinton's speech: a hotly-contested Democratic nomination race between Clinton and Sen. Bernie Sanders and Donald Trump's meteoric rise to the helm of the GOP's nomination on divisive rhetoric. No matter where you look in the current three-legged race for president, somebody is tearing someone else down. This quote, and those surrounding it, signal an important shift in this election — Clinton is no longer campaigning against Sanders (whom this quote seems to be partially directed toward), and hopes to lead the Democratic party and its electorate in a unified front against a candidate known for tearing down any and everyone who gets in his way. At this important juncture, Clinton calls for her supporters (and perhaps Sanders' supporters as well) to "lift each other up" and support the party they believe is best for the nation. Later in the speech, Clinton told supporters they are "writing a new chapter" of the American Dream, citing her own mother and the Seneca Falls suffragettes who successfully organized to get women the right to vote as others who worked to continue the narrative of American progressivism. Delivered by the country's first major female presidential candidate, it's an incredibly powerful message. Clinton seems to invoke the spirits of those suffragettes, not shying away from the historic role she's playing, stepping up to the plate ready to play ball. And let there be no mistake: Senator Sanders, his campaign, and the vigorous debate that we've had about how to raise incomes, reduce inequality, increase upward mobility, have been very good for the Democratic party and for America. She goes on to echo some of Sanders' major talking points regarding loan debt and minimum, another important shift that could help her bring former Sanders supporters into the fold. 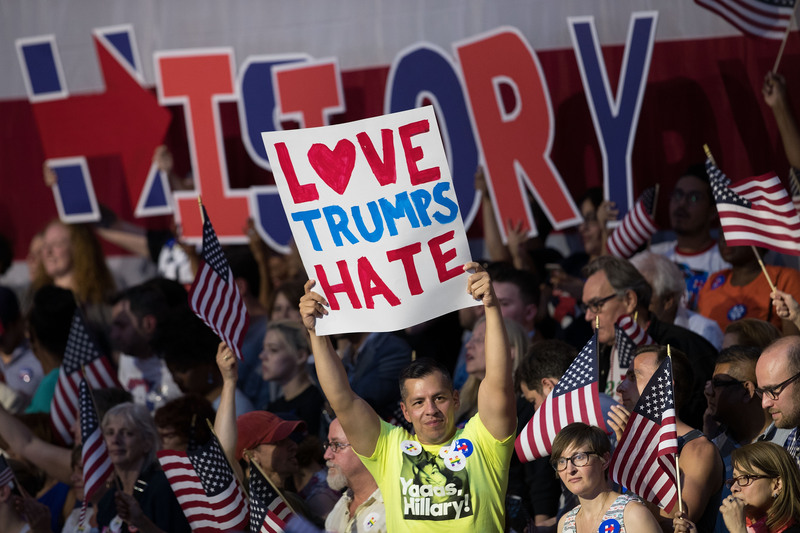 As Clinton (and Trump) look toward the conventions and the general election, the rhetoric will undoubtedly shift and change in ways that might make Tuesday's graciousness and grace a distant memory. Between now and then, Clinton's message will become even more important. Without unity, there's no way the Democrats can win in November.